Another smallish Thoughty Thursday here to get your mental corn popping. Puffin beaks are fluorescent, and we had no idea (nor do we know why, really). Sarah Smellie for the CBC. Ryan F. Mandelbaum breaks wind, er, news for Gizmodo: finally, there’s a book that can tell us which animals fart. If you’re stressed at work … everyone needs a puppy in a drawer! Be well until the weekend, when I have a blog-related decision to announce. I just finished reading Susan Cain’s Quiet: The power of introverts in a world that can’t stop talking, and I have to say that it’s changed my life. I “knew” I was introverted. I’d seen my results on various Myers-Briggs (and derivative) tests. I knew I liked to be alone and that I felt really awkward in social settings. I knew that while I’m a good trainer, that I always felt exhausted afterward. 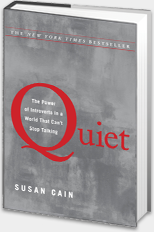 I just didn’t feel the truth of what being an introvert meant, for me anyway, until I read Cain’s book. Cain opened my eyes to who and what and introvert is and can be. When I was a kid, my mom had to stop sending me to my room as a punishment. I liked it too much 🙂 I’d just get a book, or start playing on my own. When I was a kid, I compensated for my introversion by being giggly and obnoxious. Friendships tended to wound rather than comfort. Now I totally get where I feel my power, why I’m so happy with Phil, and why I’ve been writing since I was seven years old. Even if you’re not an introvert, if you love someone who is, I’d encourage reading Quiet. It really is an incredible book. Just this past week, Porter Anderson posted on Writer Unboxed about the myth of the lonely writer. In the past few months, I’ve also started following Space 2 Live, a blog on introversion by Brenda Knowles. Here’s her lovely video: The space we need. Are you an introvert? An extrovert? Is your partner the same or the opposite? Do you have introverted children? The dynamics are potentially endless and every relationship is unique.